The Amish Urban Sleigh Bed is a contemporary style dream. Fluid, rich and smooth, the curves of this Amish sleigh bed speaks volumes. Accomplishing what modern bedroom furniture sets out to do, this Amish bed achieves greatness in a simple form with exceptional woodworking to back it up. A sleigh bed emanates cozy, inviting you right in. The Amish Urban Sleigh Bed is made in Indiana by talented Amish craftsmen. 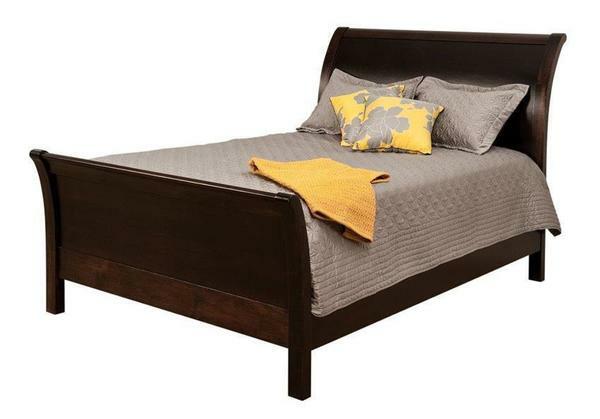 This Amish bed is one that will last longer, perform better and look stunning for generations. Amish furniture is more than solid, it's stylish and fun! Fun because the options are yours to choose from added storage to footboard height to the exact look that you can fashion with your favorite wood and finish choices. We appreciate your time spent shopping with us. Select options easily on the Select Options page and watch for updates from us. If you prefer a shopping experience with a Furniture Specialist to guide you, you've got it! We can't wait for your new custom bed to be delivered and want to be sure it has all the options you desire. Please email or call with any questions. We would love to hear from you.